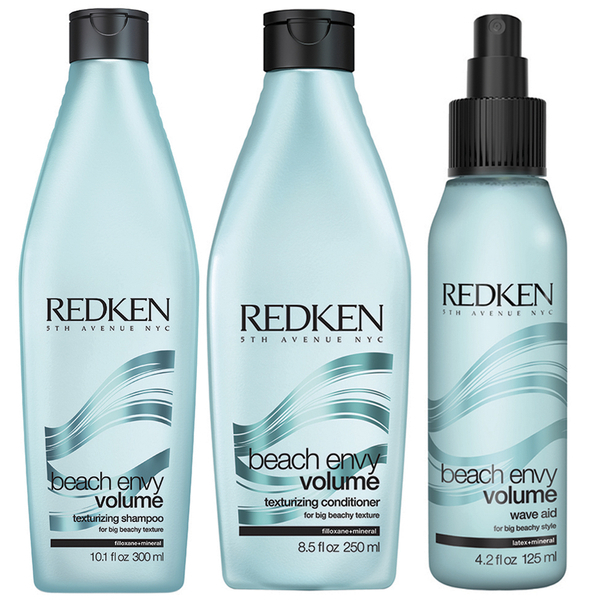 Get that effortless just-off-the-beach style with Redken's Beach Envy Volume Texturizing Shampoo, Conditioner & Volume Wave Aid Set, a trio of must-have products that work to cleanse, define and boost hair. Enriched with a blend of Filloxane, Minerals and Polymers, the shampoo effectively sloughs away dirt and grease whilst enhancing body, texture and visible fullness. Its amplifying properties help volumise and define. The weightless conditioner moisturises and detangles to leave hair smooth and easier to manage. Minerals and softening polymers encourage lift and reduce frizz, leaving locks with a healthy shine and tousled texture. Finish off the look with the Wave Aid, a leave-in treatment that creates texture and fullness. Infused with minerals, the salt-free styling spray expertly enhances volume, creating loose, beachy waves that are defined and full of movement. Apply shampoo to wet hair, massage into lather and rinse thoroughly. Follow with conditioner, distribute evenly and rinse thoroughly. Spray the Wave Aid through damp hair and scrunch in. 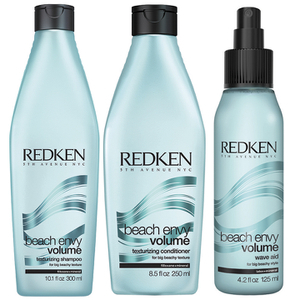 Air dry or for optimal results, diffuse for natural movement. Use a curling iron for enhanced waves. Shampoo: Aqua/Water, Sodium Laureth Sulfate, Citricacid, Cocamidopropyl Betaine, Glycerin, Sodium Hydroxide, Hexyleneglycol, Sodium Chloride, Parfum/Fragrance, Sodium Benzoate,Salicylic Acid, Polyquaternium-10, Linalool,Hexyl Cinnamal, Limonene, Calcium Carbonate,Aminopropyl Triethoxysilane, Citronellol,Sodium Acetate, Isopropyl Alcohol. Conditioner: Aqua/Water, Glycerin, PEG-40hydrogenated Castor Oil, Caprylyl/Capryl Glucoside,Hydroxyethylcellulose, Behentrimonium Chloride, Parfum/Fragrance, Phenoxyethanol, Polyquaternium-10, Hydroxyethyloleyl Dimonium Chloride, Isopropyl Myristate, Isopropylalcohol, Linalool, Hexyl Cinnamal, Limonene, Calciumcarbonate, Aminopropyl Triethoxysilane, Citronellol, Sodiumacetate, Sodium Chloride, Citric Acid. Wave Aid: Aqua/Water, Acrylates Copolymer,Phenoxyethanol, P Olyurethane 34 / P O Lyurethane-34 ,Polyacrylate-3, Peg-12 Dimethicone, Parfum /Fragrance, Polysorbate 80, Triethanolamine,Calcium Carbonate, Aminomethyl Propanol,Ethylhexylglycerin, Sodium Lauryl Sulfate,Linalool, Hexyl Cinnamal, Limonene, Citronellol,Tocopherol.